Frying a Turkey This Thanksgiving? See These Safety Tips! ~ E C Cooper, Inc. 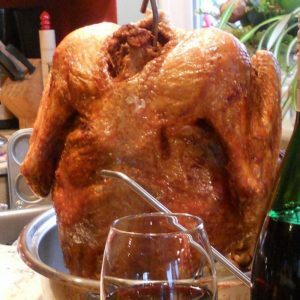 Deep frying turkeys has been a rising trend through the last decade, leading to a rise in injuries, home fires, deaths, and property damage due to deep-fryer fires. Remember these tips as you prepare to deep fry a turkey for this Thanksgiving! Never place a frozen turkey in the hot oil. Defrost your turkey fully and dry it before placing in the frying. Do not use a fryer in the rain or snow. Keep the fryer away from any combustible structures such as your home, a deck, or trees. At no time should you leave the fryer unattended. Always keep children and pets away from the fryer. Be prepared with proper equipment. Have a fire extinguisher nearby (dry-powder) and wear proper safety gear such as eye protection and grill mitts. If using a propane fryer, leave a few feet between the tank and the burner. Do not overfill the fryer and keep it on a level surface. Keep an eye on the temperature. When getting ready to place the turkey in the oil, turn the burner off until the turkey is submerged. Let the oil cool completely before disposing.